If you're obsessed with practicality dressing when it comes to fashion, you'll love this totaly stylish combo of a tobacco oversized sweater and a faux fur clutch black. Sporting a pair of black suede over the knee boots is a simple way to add some flair to your look. If you're obsessed with relaxed dressing when it comes to fashion, you'll love this extra adorable pairing of a black cutout bodycon dress and a black fur clutch. Black cutout leather pumps will add elegance to an otherwise simple look. 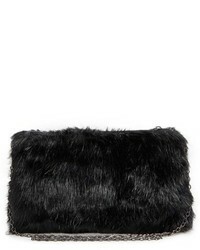 We're all seeking comfort when it comes to dressing up, and this combination of a black crew-neck sweater and a black fur clutch is a great illustration of that. Elevate this outfit with black leather pumps. If you're all about relaxed dressing when it comes to your personal style, you'll love this absolutely stylish pairing of a light blue denim jacket and a black fur clutch. Up the cool of your ensemble by finishing off with black leather mid-calf boots. If you're all about relaxed dressing when it comes to fashion, you'll love this uber cute pairing of a beige print poncho and a black fur clutch. Bump up the cool of your outfit by rounding it off with black leather mules. If you're all about feeling relaxed when it comes to picking out an outfit, this combination of a black leather biker jacket and a faux fur clutch black is totally you. You could perhaps get a little creative in the shoe department and spruce up your getup with black leather heeled sandals. If you're a fan of relaxed dressing when it comes to fashion, you'll love this absolutely chic pairing of a tan bomber jacket and a black fur clutch. And if you want to instantly bump up the style of your look with one piece, enter black cutout suede ankle boots into the equation. If you're obsessed with comfort dressing when it comes to fashion, you'll love this chic pairing of a dark green coat and a faux fur clutch black from Nordstrom. When it comes to shoes, this outfit pairs wonderfully with black leather chelsea boots. 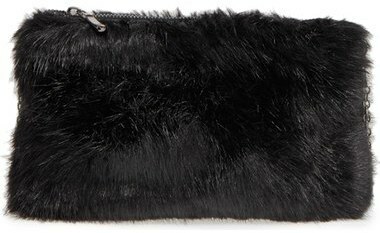 Wear a black coat and a faux fur clutch black from Nordstrom if you're on the hunt for an outfit idea for when you want to look casually cool. A pair of black leather ankle boots will add some real flair to this look.